Let's note that how you position yourself in traffic has a lot to do with whether or not other drivers notice you. For instance, if you hide behind a larger vehicle, it won't make much difference what you're wearing, or whether your lights are on. As a general rule, I try to stay out from behind view-blocking vehicles such as trucks or buses. This rider might have a good view of the intersection, but an oncoming driver might not see the bike partially hidden behind the taxi. Dropping back a few feet behind other vehicles might help others to see you. In situations like this, you shouldn't be surprised if another driver fails to give you the right-of-way. Positioning in the lane also relates to attention capture. One way to make a narrow bike look larger for a moment is to "tack" from one side of the lane to the other, showing another driver more of the side of your bike, and also adding some lateral (sideways) motion. Tacking away from a vehicle that could make a turn across your path also increases your distance, which gives you more time to react to whatever the driver does. Do you see the motorcycle hidden behind this big truck? Neither would an oncoming driver considering a left turn. Try to stay out from behind view-blocking vehicles. If you can't avoid following a truck or bus in traffic, drop back several seconds and move closer to the left edge of the lane. For instance, approaching an intersection with a possible left-turner, tacking from left to right exposes more of the left side of the bike, which might just trigger the driver to focus on you. 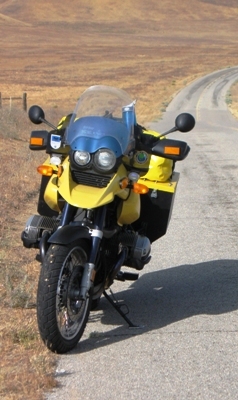 Some riders report that wiggling the handlebars causes the headlight to "flash" sideways, helping to capture a driver's attention. Tacking from one side of the lane to the other makes your bike look larger and closer, and also provides some lateral motion to help capture a driver's attention. The Olson study seems to justify the daytime use of headlights, although they didn't test multiple headlights, nor did they have wide headlight arrays such as those on some of today's big touring bikes. One problem these days is that so many cars have daytime running lights that the headlight on a motorcycle no longer stands out. The report did note that headlights that vary in intensity were observed more than a light of constant intensity. That's an indication that a modulating headlight is probably more effective than a headlight on high beam. But the headlights in the Olson test bikes varied in intensity from weak to bright, rather than flashing between low and high beams--the way today's modulators work. Some riders believe in running with the headlight on high beam in the daytime, the concept being that brighter must be more conspicuous. That may not be as effective as some would like to believe. Yes, the visual priorities are larger, brighter, more contrasting, or fast approaching. But let's note that more than a few drivers have pulled out in front of railroad locomotives equipped with very bright flashing lights. In addition to "seeing" you, a driver needs to correctly judge your distance and approach speed. How this works is that the driver remembers the shape and size, and compares that memory with subsequent glances. If the oncoming vehicle appears to be getting larger very quickly, the driver's brain calculates that it is approaching at a higher speed. There are some visual problems with an oncoming motorcycle. First, a headlight that's only 7 inches wide isn't large enough to provide accurate speed clues. And making it brighter may only confuse the mental speed calculations. The best clues about the distance and approach speed of an oncoming motorcycle are from larger objects�say the edges of the fairing, the arms of your riding jacket, or wide-apart reflectors or running lights. The Olson study mentioned that using turn signals as running lights would increase conspicuity. The Honda Gold Wing 1800 has bright running lights in the fronts of the mirrors, and this may be a very important conspicuity advantage. Adding lights or reflectors to the front of the bike, as far apart as possible, might provide the essential clues to help a driver make the snap decision that you are faster and closer, and avoid pulling into your path. 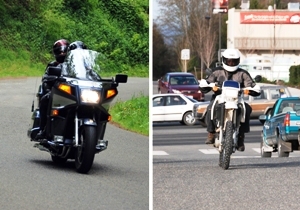 Which bike do you think is closer, the touring bike on the left, or the dual sport on the right? Here's a clue: compare the size of the rider's helmets. The KLR is actually closer to the camera. Note that the narrow front tire on the KLR also contributes to the illusion that it's farther away, while the wide running lights on the Venture make it look closer. If there is a practical way for you to add running lights, say to the fronts of your mirrors, that could be a very worthwhile way to make your machine more conspicuous. 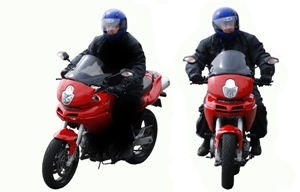 You may see some bikes equipped with two small lights on the sides of the forks, to create a triangle of lights with the headlight. That setup wasn't tested by the Olson team, but it makes sense in terms of giving an oncoming driver better clues about your distance and speed. If you compare the two machines in the photos, you'll also notice that the KLR rider's jacket is a big part of what an oncoming driver might use for judging speed and distance. A brighter color would make it more conspicuous. There's an important message in this for riders of smaller, narrower motorcycles, especially sport bikes, dual sports, and scooters. 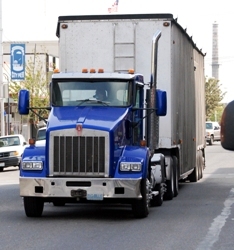 The smaller size is less likely to trigger a driver to focus on you if you're surrounded by larger vehicles. The narrow appearance makes you look farther away and slower. And if you are actually moving faster than traffic, it is much less likely a driver will correctly judge your distance and approach speed. First, take steps to increase your conspicuity, including both what you wear and the lights and reflectors on the bike. Second, since it's more likely a driver will not "see" you, be prepared for an aggressive stop or swerve when approaching any vehicle that could cross your path. The author's BMW GS has additional reflectors added to the fronts of the hand guards to provide better visual clues about it's distance and approach speed. The panel over the instruments has been painted bright blue, an "authority" color that might help capture a driver's attention. For riding at night, the Olson Report showed a definite advantage to using running lights in addition to the headlight and tail light. I suggest you park your bike along some dark street at night and see how it looks when illuminated by the lights of approaching cars. You might even perch your riding jacket over the saddle. If everything looks a little dim, consider adding accessory running lights or reflectors, amber on the front and red on the back, please. There is also reflective sheeting that looks black in daylight, and glows white when illuminated by a car's headlights at night. One big advantage of reflectors is that they use the other guy's electrical system rather than yours. The Olson Report gives us some good ideas about why other drivers see us or don't. Statistically, about half of the other drivers on the road at any moment will comprehend the presence of a motorcycle even in the best of conditions. The good news is that only a few of those non-comprehending drivers are in a position to run you over. I suggest that the less skillful you are at reading traffic, the more you'll gain from conspicuity tactics to capture attention. But since you don't know who will see you and who won't, you need to be prepared to get out of the way of any vehicles that are in a position to collide with you. That emphasizes the need to get smarter about what happens in traffic, and being skillful enough to take evasive action to avoid those drivers who really don't "see" you.